We deliver to the Omaha Metro area, Council Bluffs, Ralston, Papillon, LaVista, Gretna, Bellevue, Valley, Elkhorn, Bennington and other surrounding areas for an additional charge. 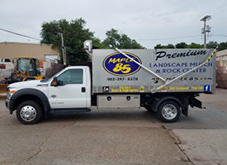 Our delivery vehicle can carry: 20 yards of mulch; 6 tons of rock or aggregate; 6 yards of top soil or fill dirt; 7 yards of top soil / compost mix (50/50) or 10 yards of NE Compost. It is possible for our delivery vehicle to carry two different products at the same time, as long as they fit within our weight restrictions. If you wish to have two products delivered at the same time, we charge an additional $20 drop fee (instead of an additional delivery fee). We can also deliver boulders, flagstone and other palletized product for an additional fee. Please call for pricing. If you don’t see your zip code on the Delivery by Zip Code list, please call for price and availability.